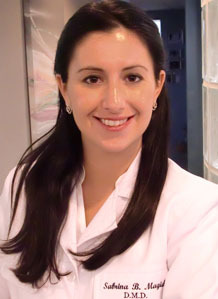 Sabrina Magid, D.M.D. did her undergraduate degree at Duke University and her Doctorate of Dental Medicine at the University of Pennsylvania. During her training she did research in the durability of the dental ceramics used in cad-cam restorations, an externship in "eastern dentistry" as practiced in China, and a medical-dental mission to the remote villages in Nicaragua and Costa Rica. Dr. Sabrina Magid completed a residency in all facets of general dentistry at NY Presbyterian-Methodist, hospital where she was awarded the "Resident of The Year". Dr. Magid brings to our office the ability to serve the often-underserved Deaf and Hard of Hearing community. She began taking lessons in American Sign Language during her early education and continued by teaching "an introduction to ASL and exposure to deaf culture" to hearing students throughout her career. Under her direction, and along with our hygienist Joanne Vergara who has studied ASL, and Nicole Gonzalez our "Deaf and Hard of Hearing Coordinator" our office has added and will continue to expand the technology and services to care for this important population.